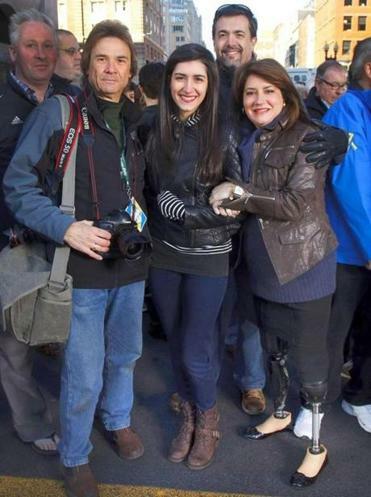 Boston Globe photographer John Tlumacki was photographed with Sydney Corcoran, her mother Celeste, and her father Kevin, at the Marathon finish line. Globe photographer John Tlumacki, who captured iconic pictures of the Boston Marathon bombings, reflects on his experience as he returns to the scene of the attacks, one year later. I didn’t know how I would feel on the one-year anniversary of one of the saddest days of my life. The Boston Marathon bombings pretty much consumed my year and emotionally drained me. The first thing I did today was text Kevin Corcoran and told him I was thinking of him. “Peace,” I ended the text with. I then walked to the spot on Boylston Street near the finish line and stood where I had photographed Kevin as he took his belt off and tightened it around the tattered leg of his wife, Celeste, to stop the bleeding. Celeste lost both legs. Kevin saved her life, just like the two heroes who saved the life of his daughter, Sydney, as she nearly bled to death near her mother. I needed to be here today, to relive all the photographs that haunted me for the past year. But the difference now is I have the strength to be able to go back and not feel afraid, or guilty. I know that the Corcorans are now my dear friends, and it makes me proud to know that my photographs showed the terrible toll that terrorism did to such an incredible family. There is no relief though from the pain I feel to this day for what happened to Krystle Campbell. I walked over to the area where I photographed her, and can only feel solemn and hurt, and angry for the death of such a beautiful person. I moved on, and walked to the Hynes Convention Center hoping to get some photos of survivors and dignitaries arriving for the one-year tribute ceremony. I saw Officer Rachel McGuire outside, and we hugged and laughed. It made me feel good to see her smile. She was the officer with the gun out in the photo I made with two other officers running toward runner Bill Iffrig when the first bomb went off. She looked happy today, and it brought a smile finally to my face. Maybe the best moment for me today was when a woman approached me and asked, “How are you, John?” She was Nicole Gross from Charlotte, N.C. A year ago I photographed her in shock as she sat on the sidewalk near Celeste Corcoran. Gross had terror on her face as she was surrounded by pools of blood and shattered glass. Her leg was severely injured, and her sister Erika Brannock lost a leg. But despite all that, even though Nicole hated the photo of herself at first, she wanted to meet me before she left Boston. She remembered me a year later, and that made me feel proud. I stood with the hundreds of people who braved the heavy, wind-swept rain on Boylston Street for a moment of silence. I was thinking that it really feels good to be here among people who care so much. When the ceremony was over, I left thinking that I can put whatever happened last year behind me. As I walked past the Forum restaurant, people who attended the flag-raising ceremony were outside, smiling and hugging one another. Now starts a new chapter. I will be at the finish line covering the Marathon again this year. Today washed away my many fears and sadness and made me realize that life goes on, and that this year’s Marathon will be the best one ever. John Tlumacki, along with his Globe colleague David L. Ryan, were finalists for the Pulitzer Prize in the breaking news photography category for their coverage of the bombings.